I’m not sure C. S. Lewis would have approved of this book. He maintained, on numerous occasions, that an author’s biography should be of no interest to the reader. Studying the lives of Milton or of Spenser, he insisted, would provide no insight into the meanings of their works beyond what an intelligent reader can gather from reading the plain texts. Still, I think Joseph Loconte’s A Hobbit, a Wardrobe, and a Great War serves a useful purpose. Amidst the tremendous popularity of the works of Tolkien and Lewis all these decades after their deaths, there’s a lot of misunderstanding about their artistic motivations (particularly in Tolkien’s case. I’m pretty sure a lot of fans of the movies think the books are about environmentalism). Loconte follows the two men’s lives, concentrating especially on their experiences in the First World War, and explains how the experience of battle (Lewis remembered thinking, “This is war. This is what Homer wrote about”) impressed itself on their memories and their imaginations. In the midst of the great disillusionment that swept Europe after the armistice, Tolkien kept his bearings, because he’d never fallen for over-optimistic enthusiasms like eugenics but had put his faith in eternal things. And in time he was able to help his friend Jack Lewis to understand as well. 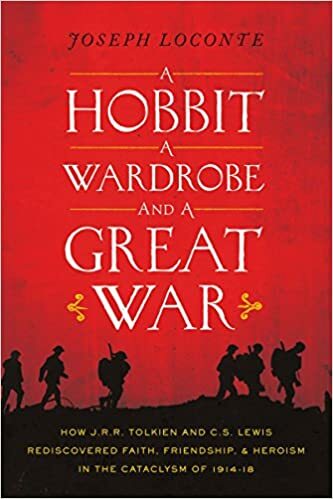 For fans unfamiliar with the lives and the thought behind the books of these two men, A Hobbit, a Wardrobe, and a Great War may be very illuminating. It’s well written and well researched. I recommend it. A great benefit from Lars completing his degree studies is the increasing stream of recommendations. Heartfelt congratulations….